Boil gnocchi as the package suggests. While the gnocchi is cooking, heat the butter, and saute the bacon and onions together (if using proscuitto, add it at the end!). Add the Arugula next, only time enough to make it wilt. 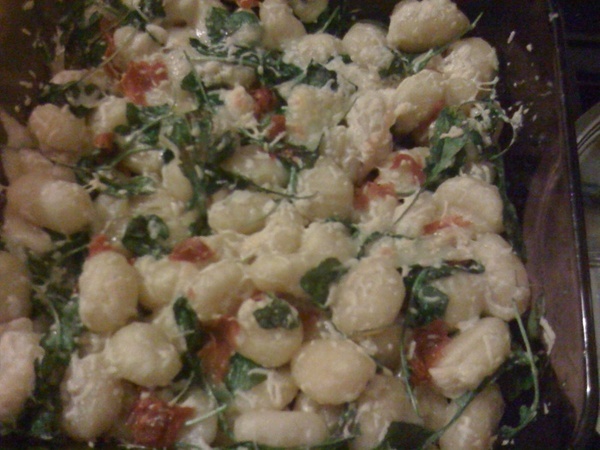 Add cheese to taste, then stir in the gnocchi ( now add proscuitto). Place the meal in a oven safe dish, top with more cheese, and put under high heat broiler for a few minutes; long enough for the cheese to melt and brown a bit. This entry was posted on December 26, 2009 at 7:51 pm and is filed under Absolute Beginners. You can follow any responses to this entry through the RSS 2.0 feed. You can leave a response, or trackback from your own site.